It's a sunny day in Dubai when we sit down with Alberto Morillas. The master perfumer for Bulgari is in a good mood and cheerily says, "I remember your face... have we met?" This is, in fact, the second time we've spoken—the first time last year in Rome, for the launch of Goldea, The Roman Night—and it's a testament to Morillas' astute nature and great memory. After all, this is the man who has famously created more than 200 fragrances (including Calvin Klein CK One, Kenzo Flower, and Bvlgari Omnia, just to name a few) and shows no sign of slowing down. So, what exactly goes on behind the creation of a sensory masterpiece? The 67-year-old nose has a few surprising insights. What's your starting point for a new fragrance? Alberto Morillas (AB) When I start on something new, I always start for me first, because I need to understand the creation. After I have a nice accord, I would present it to Bulgari and have it handmade for them. As a perfumer, we need to be allowed to create. We can’t have too many people telling us what they like, or which notes they prefer. When it’s almost finished, I would present it and work with the brand on the final product. You've been working with Bulgari for a long time. Tell us more about your relationship with the house. AB For me, the brand is about very strong design and the history. It’s a traditional house with a long history, and I love the stories of Bulgari. When you see pictures [of the perfumes], you might think its simple, but they are all very strong signatures. Or, you may think the perfume is very easy to wear but all the fragrance families have a signature scent. For Le Gemme Reali, it was all about gems: emeralds for Veridia, rubies for Rubinia, and sapphire for Nylaia. AB Not really. But I would say to start, Nylaia, which represents sapphire, was the easiest to create because it’s blue, so for me, it's about the sky, and it’s passionate. You once said that wearing perfume is just like putting on jewellery. If you were to reimagine the fragrances, how would you 'wear' them? AB Sapphire is a very nice, especially if there are many tiny stones set together, and it would be beautiful as earrings. I think emerald would be more for the decollete, as a necklace, and perhaps the ruby would be a ring, because it’s so bold, strong and passionate. 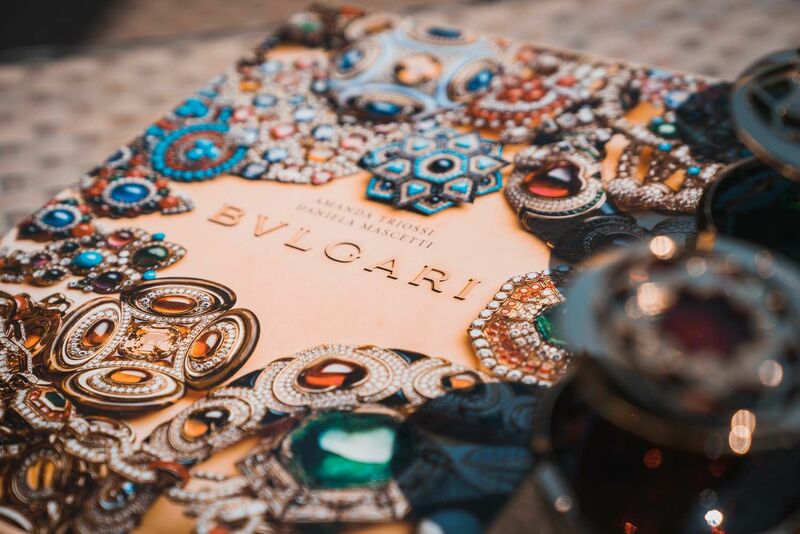 Bulgari has always created stories about powerful women. Who would you say inspires you? AB My wife. She’s strong and very wise. You’ve created so many fragrances, how do you keep getting inspired? AB I love creating perfumes, and I’m always inspired. It’s my job to get inspiration; to keep searching for it. But working with Bulgari on this, the story of the three gems in itself is amazing. It’s become very trendy to layer perfumes atop one another. What do you think of that? AB I think you need to be very careful when you mix. For me, you may choose to wear a scent on one arm and another on the other arm, but if you were to spray them together, it’s not that easy. Personally, I wouldn’t recommend it, because you truly need to understand which notes would go well together. Is there a right way to apply perfume? AB In Singapore, I've heard that some people love to spray [perfume into the air] and walk through, but that way, you waste a lot of it. When you apply just a little bit on your pulse points, the scent is warmed and it lingers on longer. When someone walks by, you can catch the scent of perfume. A fragrance is for you, so you should use it on you. How do you prolong a fragrance in our humid weather? AB It’s always nice to spray a little bit on your clothes because it will stay on longer. I feel the cocktail of the musk in Bulgari fragrances matches with your emotions, so when you feel warmer, the scent comes out more. I think people in Singapore generally don’t favour something too strong—it’s all about having a good balance. Do you wear perfume yourself? AB Yes, of course! I’m now wearing the next masculine fragrance from Bulgari that will be launching later this year. Read more about the Bulgari La Gemme Reali collection in the June 2018 issue of Singapore Tatler.